Sprains and strains, from twisted ankles to aching backs, are among the most common injuries. 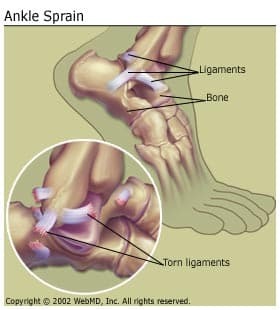 A sprain is a stretching or tearing of ligaments, the tough, fibrous bands of tissue that connect bones to one another at a joint. 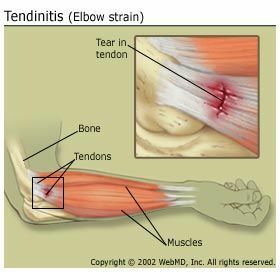 A strain is a stretching or tearing of a tendon or muscle tissue, commonly called a pulled muscle. Given adequate time and rest, most sprained joints or strained muscles will heal themselves. But severe tearing or complete rupture of the affected tissues usually requires surgical repair. And damage caused by a sprain can leave the bones in the affected joint improperly aligned, or the ligaments so stretched and weakened that the joint is particularly vulnerable to future injury. Anything that places sudden or unaccustomed stress on joints or muscles may cause a sprain or strain. Falls, lifting heavy objects, and the exertion of an unfamiliar sport, knocking a joint out of position and overstretching the supporting ligaments or muscles, are common culprits. Chronic overuse of a joint can also lead to stretching of ligaments, chronic inflammation, or chronic irritation of a muscle tendon. Being overweight, inactive, or in poor physical condition boosts the likelihood of injury. Improperly warming up and not stretching muscles before intense physical activity can also result in injury.